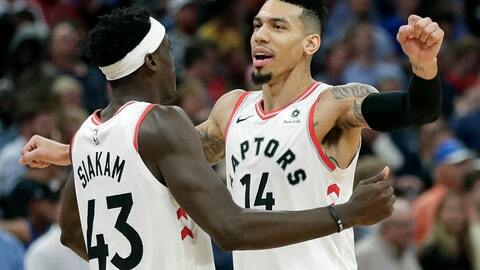 ORLANDO, Fla. (AP) — Danny Green watched helplessly from the paint while Evan Fournier dribbled past and dunked a tying basket with 2.3 seconds left. Green made a fade-away jumper with less than a second remaining to lift the Toronto Raptors over the Orlando Magic 93-91 on Tuesday night. He caught Kyle Lowry’s inbound pass with 2.3 seconds left, pulled up on the left side of the lane and hit a jumper with 0.5 seconds showing. Orlando’s Nikola Vucevic missed on a 67-foot heave as time expired. Toronto didn’t take much advantage of the drought. The Raptors could only put together a 3-pointer from Green and a layup by Jonas Valanciunas during that stretch to take an 80-77 lead. Raptors: Toronto didn’t have a player reach double-figure scoring in the first half. … Toronto got 17 second-chance points. Magic: Backup F Terrence Ross, the hottest shooter on the Magic over the last five games, was just 2 of 10 against his old team. … The Magic shot only 41.5 percent for the game.